If you're interested in the same mechanicals but a different look, the Saturn Outlook has been a much slower seller than the Acadia, even though they're essentially identical. The 2009 GMC Acadia is better-looking than most minivans, and a whole lot more useful than full-size SUVs for passenger duty. 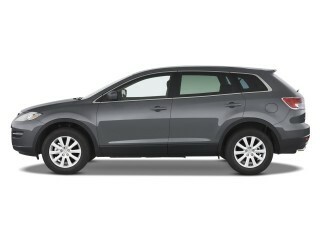 TheCarConnection.com's editors read the latest reviews on the new 2009 GMC Acadia to write this comprehensive review. 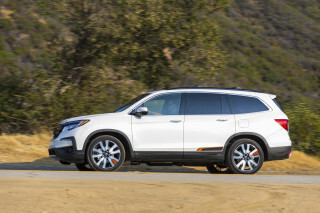 Experts from TheCarConnection.com also drove the GMC Acadia and have included opinions and details where they aid you in choosing the perfect new crossover vehicle. The 2009 GMC Acadia is one of the more carlike "crossover" SUVs, offering a very passenger-friendly interior, carlike handling, and a roomy interior. The Acadia can be specified with front- or all-wheel drive, but there’s no two-speed transfer case or four-wheel-drive low range, and as a result, not much in the way of off-road ability. But that's OK because the Acadia's not meant to tackle rutted backwoods roads. Instead of unused off-road capability, the Acadia offers everyday drivability to buyers. Interior space and well-configured seating are what make the 2009 GMC Acadia especially appealing. 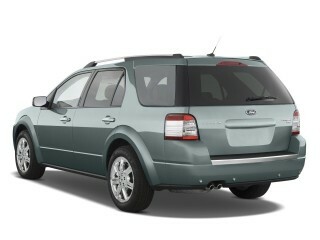 A third-row seat is standard, which yields room for seven to eight people altogether (depending on the configuration). The third row's a real third row, too. There's almost 20 cubic feet of additional storage space behind the third row; plus, maximum towing capacity is 4,500 pounds. The 2009 GMC Acadia comes with a single powertrain, a healthy 288-horsepower V-6 that gets direct injection for 2009, and standard six-speed automatic transmission. Acceleration is good, but the transmission sometimes hunts for the right gear and jostles the Acadia's occupants in the process. EPA estimates give hope for 17 mpg city/24 mpg highway for front-wheel-drive models. The GMC Acadia's optional AWD system (which can transmit as much as 65 percent of engine power to the rear wheels as necessary) is plenty for snow days or muddy back roads on the way to the cabin. The base models come quite well equipped, with 18-inch rims, front and rear A/C, stability control, full-row curtain airbags, and GM's OnStar concierge system with "turn-by-turn" navigation assistance. Higher-end models can be optioned up with all the niceties, from a 10-speaker Bose surround-sound stereo to three-zone climate control, a power rear liftgate, a head-up display (HUD), GPS, a two-panel sunroof, XM NavTraffic, Bluetooth, a rearview camera, and backseat DVD entertainment system. The 2009 GMC Acadia is a stunning entry from GM both inside and out. The 2009 GMC Acadia boasts some of the most attractive exterior styling in the crossover class, and reviews read by TheCarConnection.com show that the stylish touches carry over into the interior. The GMC Acadia, "along with its corporate cousins, the Buick Enclave, Chevrolet Traverse and Saturn Outlook ... has a unibody architecture," according to Edmunds, and is "offered in three trims: base SLE-1 and uplevel SLT-1 and SLT-2." The external differences are few, and all GMC Acadias come with "18-inch alloy wheels," states Edmunds, which also says that it was "hands-down the handsomest vehicle" in a recent test. MyRide.com reviewers agree, claiming that "the GMC Acadia may be the best looking of the Lambda triplets," and is "one of the sharpest looking vehicles in its class, period." Kelley Blue Book finds a few other adjectives to describe the GMC Acadia, calling it "handsome," "masculine," and "upscale." Cars.com is impressed enough to conjecture that "someone with fashion sense resides inside GM's design studio." The interior styling is a hit as well, and MyRide.com kicks things off by claiming that the interior is "very tasteful," thanks to its "dual tone look, with satin-finish and chrome accents." Cars.com appreciates the "clear gauges and easy-to-use buttons," while Kelley Blue Book raves about the "attractive two-tone look [that] is used throughout the Acadia lineup, with an available 'brick interior' adding striking red surfaces for those with adventurous tastes." On a more practical note, ConsumerGuide says that, "day or night, Acadia's luminous gauges are easy to read," while "the optional head-up display projects vehicle speed and other readings on the windshield." It's no enthusiast vehicle, but the 2009 GMC Acadia is punchy enough to keep you from falling asleep. 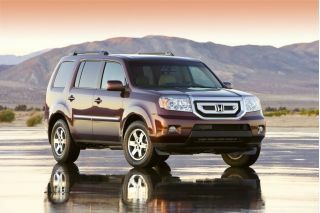 GMC has introduced a new engine for 2009 that bumps up the power output with only a minor hit to fuel economy. Other than the new powerplant, the 2009 GMC Acadia is still the same pleasant and capable crossover, at least performance-wise, found on dealer lots last year. The new powerplant on the 2009 GMC Acadia, which Edmunds says is a "3.6-liter V6 with direct injection that makes 288 hp and 270 pound-feet of torque, spread over a broad rpm range," is a welcome addition to the GMC Acadia. Consumer Guide is impressed by the engine's power, noting that "the Acadia offers better than expected acceleration both around town and on the highway." MyRide.com testers also love the V-6 under the GMC Acadia's hood, finding that it "is certainly willing, with smooth power delivery and even a good growl as the revs rise," and reporting that they "couldn't be happier" that this is GM's "new corporate V-6." This power also provides for a towing capacity that, "at 4,500 pounds when properly equipped, should be enough for most folks," according to reviewers at Edmunds. The GMC Acadia's transmission rates fairly well, though reviews read by TheCarConnection.com show that it's not quite as stellar. Edmunds says that the GMC Acadia "can be had with either front-wheel drive or AWD" that is "matched to a six-speed automatic transmission." MyRide.com reports that the "transmission is mostly a willing partner," and "its six speeds usually swap quickly, although we did notice some upshift jerkiness at full throttle and the occasional downshift hesitation." ConsumerGuide reviewers add that "the transmission shifts smoothly but is often caught in too high a gear" and "a prod of the throttle sometimes results in slow downshifts for passing power." The large, heavy GMC Acadia isn't as thrifty as you might hope for a crossover, but it won't shock the environmentally conscious either. According to the official EPA estimates, the 2009 GMC Acadia should return 16 mpg in the city and 23 mpg on the highway in all-wheel-drive versions, while the front-wheel-drive models get 1 mpg better in each. The 2009 GMC Acadia does well with reviewers in other areas like handling and braking. 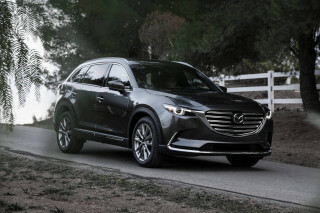 Consumer Guide says that the vehicle is also "impressively stable and agile" but "difficult to maneuver in tight spaces due to its long, wide body." Edmunds mentions that the GMC Acadia is "easy and pleasant to drive, especially considering the vehicle's size and 4,700-pound curb weight," and USA Today credits the "extraordinarily well-balanced steering." In terms of stopping characteristics, MyRide.com comments that there is "minimal dive...under braking." A few gripes about the materials inside the 2009 GMC Acadia are the only complaints worth mentioning in this category. 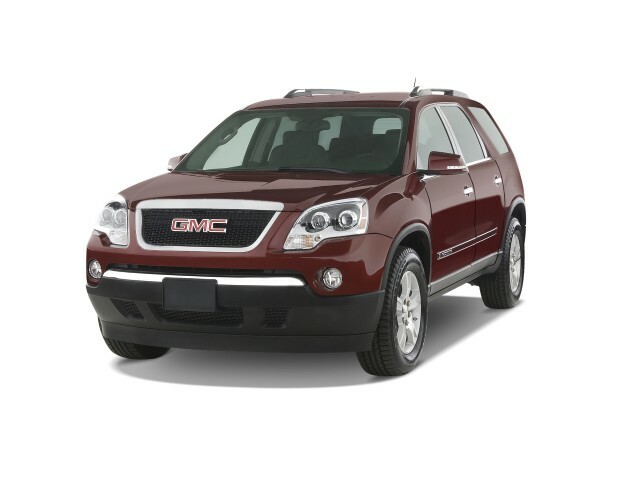 Reviews read by TheCarConnection.com unanimously praise the efficient, comfortable interior design of the 2009 GMC Acadia, though some find fault with the materials quality in this stylish crossover. The automotive press raves about the seating arrangement inside the new GMC Acadia, with Edmunds reporting that, "thanks to its space-efficient design, the GMC Acadia provides large-sedan-like comfort for all passengers." Edmunds adds that "a third-row seat is standard, and one may choose between seven- and eight-passenger configurations" thanks to the available middle-row captain's chairs. Up front, Consumer Guide points out there's "plenty of headroom and legroom," while "the seats are generally supportive and comfortable." That trend continues in the rear two rows, where Cars.com is pleased to find "easy-to-configure second- and third-row seats," and Consumer Guide says that "the 3rd row can accommodate six footers—though they'll ride knees up." Cargo space is also a plus for the 2009 GMC Acadia, thanks to what Kelley Blue Book terms a "roomy, versatile" interior. 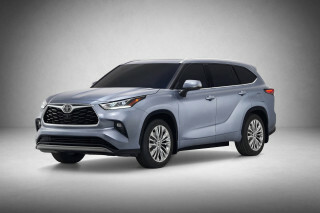 Cars.com reports that "with the second- and third-row seats folded, there is 116.9 cubic feet of cargo space," which "eclipses the Toyota Highlander, Honda Pilot and Mazda CX-9" and is even "more cargo volume with the seats down than [the] Yukon." Consumer Guide agrees, rating the 2009 GMC Acadia a perfect 10 in terms of cargo room and deeming it "is the largest among midsize SUVs," while "several bins and cubbies provide good interior storage." Although its virtues in terms of comfort and capacity are numerous, some reviewers find that the 2009 GMC Acadia is plagued by materials quality problems. The New York Times is probably the most critical, griping that "the company's secret contract with Cheap Plastic Inc. may not be over yet: the Acadia's interior driver door handle, that critical hands-on interface between man and machine, was unpleasantly sharp and finished in bogus chrome." Consumer Guide offers a more mixed review, saying that "though there are few padded surfaces, bright accents and richly grained plastics give the interior an inviting look." Edmunds supports that opinion, finding that the Acadia offers "mostly solid materials and build quality, though a few lower-grade plastic pieces can still be found." In terms of construction, Consumer Guide remarks that "build quality has been good." One area where the 2009 GMC Acadia earns a bit of unexpected praise is in terms of cabin noise. In this respect, Consumer Guide says that there is "little road rumble, though the 19-inch tires thump slightly over bumps. Wind noise is low, with only a muted whistle from the outside mirrors at highway speeds" while the "Acadia's quiet, refined engine growls pleasantly under brisk acceleration." Ride quality for the Acadia is also lauded. According to The Orlando Sentinel, the 2009 GMC Acadia "rides very nicely even on rough pavement." Consumer Guide agrees, calling the GMC Acadia "comfortably composed and controlled." The new rearview camera option for the 2009 GMC Acadia corrects what is the only real safety concern for this crossover. The 2009 GMC Acadia is a true class standout when it comes to the safety category, earning rave reviews from all sources researched by TheCarConnection.com. One of the most intuitive measures of a vehicle's safety is how it performs in crash tests, and in that regard the 2009 GMC Acadia is flawless. In NHTSA tests the GMC Acadia earns a perfect five-star rating in every category, including front and side impacts on both the driver and passenger sides. The IIHS reports similarly high scores for the GMC Acadia, which earns the highest possible rating, "good," in both the frontal offset and side impact tests. The IIHS also awards the 2009 GMC Acadia its prestigious Top Safety Pick award for 2009, citing the Acadia's "good performance in front, side, and rear tests and standard electronic stability control." Overall safety involves a whole lot more than simply excellent crash-test ratings, and the GMC Acadia offers a wide range of safety features to complement its strong frame. Edmunds reviewers find that the standard safety features on the 2009 GMC Acadia include "antilock disc brakes, stability control, front-seat side airbags, full-length side-curtain airbags and the OnStar communications system." In addition, Consumer Guide reports that "traction control" and an "antiskid system" come standard, as well as an "antiskid system w/rollover sensors [and] tire-pressure monitor." Reviews read by TheCarConnection.com show that driver visibility, at least out the windshield, is not a concern in the 2009 GMC Acadia. According to The New York Times, "front visibility is excellent, though the tall rear glass makes it especially hard to find the vehicle's rear end while backing up." Consumer Guide agrees, noting that the "high beltline in back makes the available rear obstacle detection and rearview camera worthwhile options." The addition of a rearview camera and real-time traffic complete an already excellent features package on the 2009 GMC Acadia. Last year's GMC Acadia was no slouch in the features department, but the folks at GM apparently weren't satisfied and have included several new features for the 2009 edition of the GMC Acadia. The 2009 GMC Acadia comes with a wide range of standard features, whether in SLE or SLT trim. Edmunds reviewers proclaim that "the level of standard equipment in the Acadia is comprehensive," and Consumer Guide reports that the list includes "front and rear air conditioning w/rear controls, OnStar assistance system," and full power accessories. The upscale SLT trim adds "tri-zone automatic climate controls" and a "Bose sound system," along with a "wireless cell phone link," according to Consumer Guide. Kelley Blue Book says that an "AM/FM/CD stereo with six speakers and MP3 capability and XM Satellite Radio" is also included as standard fare on both models. In addition to the standard features found on the 2009 GMC Acadia, GMC has included a lengthy list of options to satisfy discerning buyers. Headlining these options, according to Cars.com, are "leather seats, ultrasonic parking assist, a DVD-based navigation system and a Bose 5.1 surround sound audio system." 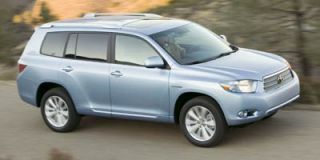 Consumer Guide also finds that some new features for 2009 "are a wireless cell phone link, heated and cooled front seats, and satellite radio with real-time traffic updates." Consumer Guide adds that "a rearview camera is available on any Acadia, whether or not it's equipped with the optional navigation system," which serves as an excellent supplement to the sonar parking assist. 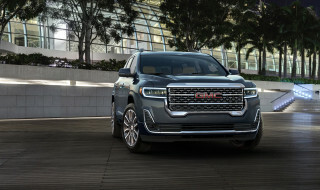 In TheCarConnection.com's research, MotherProof reviewers offer up the best summary of the GMC Acadia's features, declaring that "the Acadia really has just about every feature you could possibly want, plus some you've never imagined." Looking for a different year of the GMC Acadia?